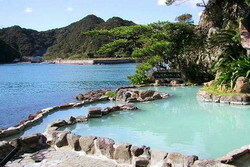 Hakone is one of the most popular resorts. 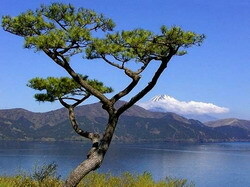 The region is located within a large volcano between Mount Fuji and the peninsula of Izu . 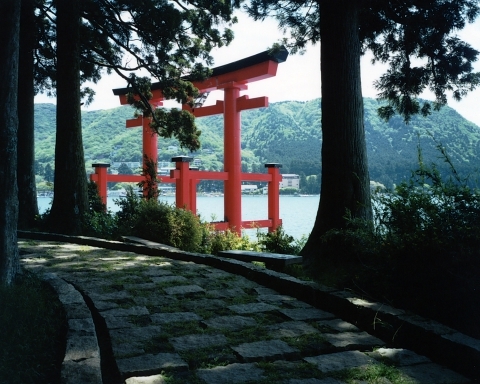 Hakone is located on the shores of one of the biggest in Japan’s Lake Biwa. Hakone offers tourists a lot of different attractions: an infinite number of museums, art galleries with compositions full of expression, incredibly beautiful recreational areas, crystal clear lakes, colorful forests and parks, world-famous hot springs, volcanic islands. But of course, the main attraction can be called a national park “Fuji-Hakone-Izu National Park”, whose area totals 1227 sq. m. This is an incredibly beautiful place embodied the whole charm of the national culture of the Japanese. Do not miss a single attraction of the park will help you a special train Tozan monorail or tram. 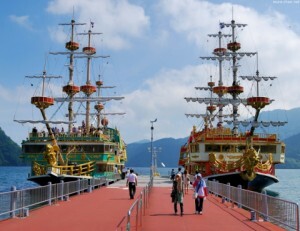 A ride on the “Fuji-Hakone-Izu National Park” for this transport, you will get unforgettable impressions, a huge charge of vivacity and spirit. Forest Ovakudani impress you with a riot of colors. The landscape there is so fabulous that sometimes begins to seem that you are looking at the web talantlavogo artist, not the surrounding reality. 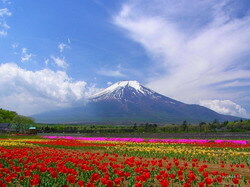 Special attention is given and an unusual double volcano Ovakudani , which is still active. Translated Ovakudani sounds like “great hell.” Photos on background is striking in its symmetry of Mount Fuji – the unforgettable memory of the conducted tour in Japan. Of great interest to tourists will be complex-Kovac Rotenburo -Bath located on elephants mountains in the open air. The most famous complex of thermal springs – Yunessan . It offers many special baths with various fillings: rose, wine, lavender, green tea … The client, enjoying the mountain scenery, lying in a warm some water, sipping warm rice sake. These impressions from such an unusual closeness to nature is impossible to forget. For those who like to stroll along the Hakone Museum offers a very wide sampling of Natural History Museum, Forest, Mosaic Museum and Glass, Toy Museum, Museum of Arts and Culture. Museum of Natural History “Ovakudani” will tell you the whole history of Hakone and its volcanoes, lakes and springs. Museum of Forests will provide you with the opportunity to understand the structure of the forest life the sounds of nature and observe the life of animals, whose role is performed by robots. A special room will make you think about the current situation with the Earth’s ecology. Hakone Museum of mind will take you in the time of ancient battles, providing you swords, spears, scrolls and uniforms Japanese warriors. Also located in Hakone is one of Japan’s major castles . He can not enchant its simplicity and grandeur at the same time. Visit this attraction can be anyone. By visiting Hakone, you are fully imbued with the spirit and culture of Japan.